In a time of darkness… As the Nazi war machine rolls across Europe, young Jacob Weisz is forced to flee his beloved Germany and join an underground resistance group in Belgium. In occupied France, assistant pastor Jean-Luc Leclerc and his wife find themselves the accidental organizers of a relief movement involving their entire town, as Jews from all over Europe arrive at their door, hoping for shelter from the growing political storms. …when all seems lost… As World War II rages, both men find themselves in a living nightmare. When a rescue operation goes horribly wrong, Jacob ends up trapped in a crowded, stinking cattle car on a train to southern Poland, while Luc is arrested and beaten by the Gestapo for helping Jews. Both men are sentenced to hard labor at Auschwitz. There they will be pushed to the very limits of human endurance…and beyond. …a ray of hope remains. 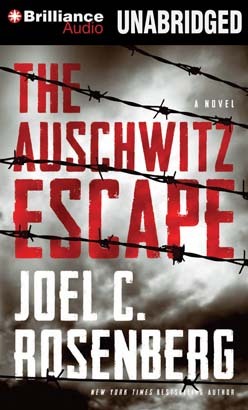 The Protestant pastor and the Jewish freedom fighter seem an unlikely pair, yet these two are chosen to risk one of the most daring and dangerous feats imaginable—escape from Auschwitz. Their task is to get beyond the fences, evade the Gestapo trackers, and make it to the Allied forces, where they must reveal the awful truth of what is happening in Poland before Fascism overtakes all of Europe. The fate of millions hangs in the balance. Best I've ever heard hands down.